"Should we not mention among our truly noble buildings...the Temple of Peace...buildings the most beautiful the world has ever seen?" 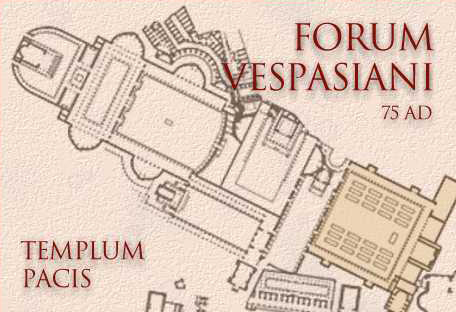 The third of the imperial fora, the Forum of Vespasian (Forum Vespasiani) or, more properly, the Templum Pacis after the Temple of Peace that dominated the complex, was vowed by Vespasian in AD 71 after the capture of Jerusalem and dedicated four years later (Dio, LXV.15.1). It commemorated both the end of the Jewish war and the civil strife that had followed the death of Nero in AD 68. The forum, itself, consisted of a large enclosed square surrounded on three sides by raised porticoes with columns of pink granite from Aswan. Along the lateral walls were two small rectangular exedras. Across the principle façade, the colonnade was in line with six larger and more widely spaced columns that fronted the temple, which was preceded by an altar. Commemorative coins minted in AD 75-76 show a seated figure of Peace holding a palm frond in her right hand. Placed in the apse of the temple, the cult statue is mounted on a podium which is flanked by two blocks of travertine that are conjectured to have held spoils from the Temple of Jerusalem. On either side of the temple and continuing the line of columns were two large halls, with rooms thought to house Greek and Latin libraries (Bibliotheca Pacis) containing, among others, the works of Galen and Lucius Aelius (Gellius, XVI.8.2). Virtually nothing of the forum now remains except a preserved wall and one of the exedra, which was reused as the Torre dei Conti. References: Josephus: Jewish Antiquites (1965) translated by Louis H. Gelman (Loeb Classical Library); Pliny: Natural History (1945) translated by H. Rackham (Loeb Classical Library); Suetonius: The Twelve Caesars (1979) translated by Robert Graves (Penguin Books); Aulus Gellius: Attic Nights (1927) translated by John C. Rolfe (Loeb Classical Library).